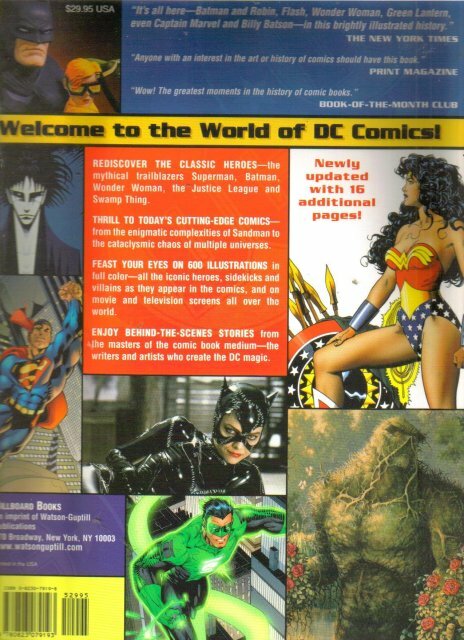 By Les Daniels - Watson-Guptill (2003) - Paperback - 272 pages - ISBN 0823079198 Now updated, expanded, and available in paperbackthe definitive chronicle of DCs celebrated characters and their talented creators! In the nearly 70 years since the creation of the first super- heroes, DCs legendary team of artists, writers, and editors have developed, refined, and extended the reach of their comic book characters.DC Comics: A Celebration of the Worlds Favorite Comic Book Heroescelebrates the remarkable history of Americas leading comic book publisher. Packed with 650 dazzling, full-color illustrations, here is a mesmerizing account of DCs growth, tracing the complex genealogies of its legendary characters and describing the behind-the-scenes dynamics that influenced its stories. It also features dozens of personal interviews with the artists and writers who provided the creative genius for DCs classic characters and their amazing adventures. 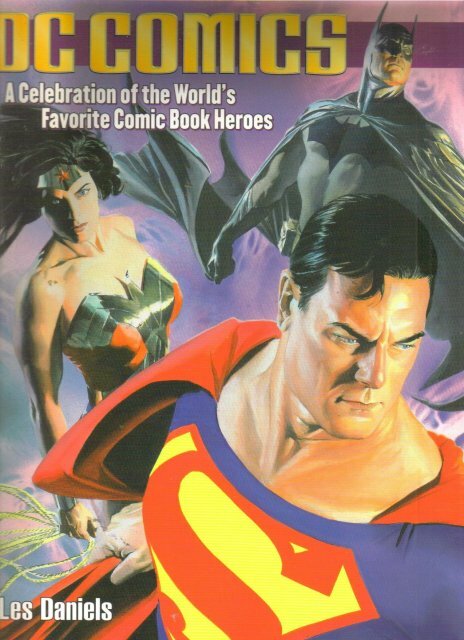 This updated paperback edition sports a brand-new cover by legendary comic book artist Alex Ross, as well as new chapters on the acclaimed graphic novelsKingdom ComeandThe Dark Knight Strikes Again. Readers will also find brand-new material on Supermans wedding; the moviesBatman ForeverandBatman & Robin; the Smallville television show; WildStorm comics; and many other exciting comics including JLA, Green Arrow, and Preacher. Filled with comic book artwork, conceptual sketches, and original character designs; scenes from animated cartoons, movie serials and features, television shows, and Broadway musicals; superhero toys, games, comic collectibles, trading cards, and panels from graphic novelsthis incredible chronicle is the perfect reference for fans of popular history, art, comics, and everything in between!  New paperback edition includes 16 additional pages that update the DC Comics universe from 1994 to present and features 40 new illustrations  Features a brand-new painted cover by Alex Ross, the acclaimed Norman Rockwell of the comics world  DCs fictional universe has branched into a worldwide wealth of entertainment formats, including books, toys, movies, radio, television, video games, and an on-line computer networkand their diverse group of comic characters are more popular than ever. Pictures shown of the front and back covers of this book are of the actual book for sale, not file photos. Items Similar To "DC Comics A Celebration of the World's Favorite Comic Book Heroes..."